In our design brief, we were prompted to explore mesh networks. Mesh networks are essentially Bluetooth-enabled networks that allow for communication despite no connectivity. We were further inspired by Jott, an app that leverages mesh networks to facilitate messaging in low-connectivity areas. In our preliminary research, we found that peer-to-peer payments are understood and carried out differently across different cultures. Given the time constraints of the sprint and our inability to travel to various cultures, we decided it would be best to focus on a culture we knew: rural America— our own backyard. With millions of Rural Americans lacking access to the internet, these people are not able to access online banking features which are becoming ubiquitous. 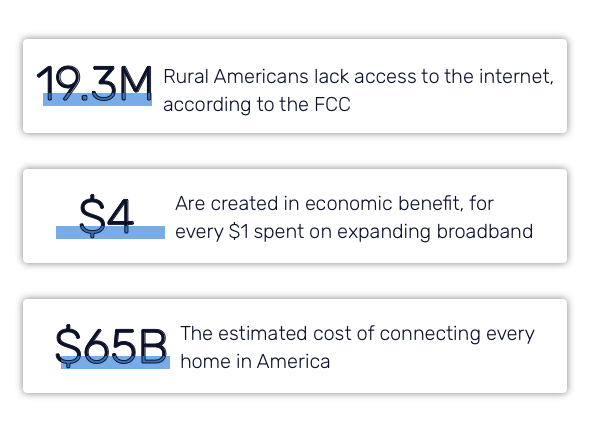 With the billions of dollars it would take to connect every home in America, we felt that there was an opportunity to utilize mesh networks to enable community-based interactions. Mesh is a mobile app & mesh network system that allows people in low-to-intermittent connectivity areas to complete peer-to-peer (P2P) transactions offline. Individuals can interact without internet, data, or any connectivity and can send payments to each other over the Mesh app. The Particle devices "listen" for this transaction (i.e. they are plugged into an outlet in your house) and relay that information across the mesh network. The app also simulates the updating of your account in real time by either crediting or debiting your account. That transaction information is stored in a ledger - we used a google spreadsheet for the prototype - which is then picked up by a public utility vehicle (i.e. a mail delivery truck), that is outfitted with a special mesh node. In our case, the USPS truck was equipped with a Particle Argon device, which is able to communicate with mesh networks as well as WiFi. The mail truck then “delivers” the transactions when it reaches a connected area. The ledger of transactions is updated to the financial institutions. When the vehicle returns to the mesh network, the updated bank account information is flashed back across the mesh network so that each node now reflects the accurate information that corresponds to the transaction history. In order to communicate the proposed system, we printed out a huge map of Maine and set up a mesh network out of Particle Xenon microprocessors that were able to communicate with each other and also with our offline messenger app, Mesh. We used a remote control car (which we outfitted with some USPS branding) to simulate the utility vehicle that enters and exits the low-connectivity area on a regular basis. Red and blue areas simulated low- and high-connectivity areas, respectively. Mesh networks can be powerful tools for connecting communities in ways beyond just messaging. We found that P2P transactions are just one of many applications for mesh networks to relay data to the larger network once connectivity is reached. There's a technological opportunity for these kinds of networks, which are inherently portable, to be set up for not just rural America, but for other low-connectivity scenarios like natural disaster relief areas or refugee camps.